Ideal for over-sized windows and large patio doors, 4.5" Vertical blinds bring 33% more view when opened and maximum privacy when closed. This vertical blind features a wand tilt that gives you trouble-free light control and iscord freefor added safety. The reversible head rail allows either right or left hand opening so it can work in anyroom. This product also features a self-aligning louver rotation system which automatically re-aligns louvers. Cordless Day/Night Cellular Shade Sheer/Shadow White 27-inch x 48-inch (Actual width 26.625-inch) The right window shade can refresh your room with light and colour. When making your choices, be sure to think about how much light you need. A sheer cellular shade will filter light gently into your space, while a black out cellular shade will stop unwanted brightness. You'll also want to consider tone and texture. What shade will complement your furniture, floor coverings and wall colour? Cordless Day/Night Cellular Shade Sheer/Shadow White 27-inch x 48-inch (Actual width 26.625-inch) is rated 3.7 out of 5 by 3. Rated 2 out of 5 by Pickster from Look Beautiful. TERRIBLE chemical smell. I have replaced ALL of my home's blinds with these these about 3 years ago. The areas that are shaded and typically dont get hit with much sunlight "seem" to be fine. However, STILL after 3 years, the areas that get hit with direct sunlight (even in winter) produce an EXTREMELY STRONG offgassing odour. Unfortunately one of these rooms is my bedroom. It is so strong that I can't sleep through it. I have to jump up and open my windows to air it out. If I leave the house for a couple of hours without opening my windows in the summer, the chemical smell can be smelled downstairs. In my opinion, this just CANNOT be good for your health. I was hoping overtime the smell would go away - especially with daily airing out even in winter but it's not. I think I'm going to have to replace at least my bedroom coverings and 1 or 2 other rooms. I'm sure it's not good in the other rooms either the chemical odour is not obviously detectable. I will start replacing those over time. The other issue is that the caps keep falling off the edges. That's an easy fix but a repeated nuisance and the pull tab does not feel sturdy so I pull from the bottom bar, not the clear tab provided. These are lovely to look at and filter or block out light as stated but you will have to decide for yourself if you can get past the odour if you have hot/sunny rooms. These are not cheap blinds either. I'm disappointed I'm going to have to start replacing them. One room alone has 5 window coverings. Rated 4 out of 5 by timbitandmuffin from Excellent blinds that can blackout or sheer We have been intrigued by cellular blinds for many years now and don't have much experience with them so we had some key questions that have now been answered after purchasing 3 of these to cover our living room window. 2 x 27" and 1 x 60". 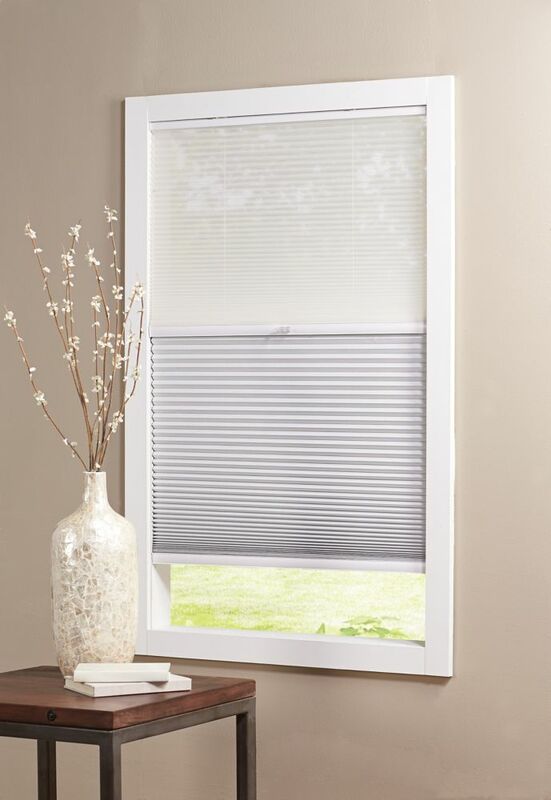 If you are considering cellular shades, stop tossing over sheer or blackout and just get this one because it does both! 1. The fabric looks like paper so how durable is it? It is not paper but a type of soft polyester fabric (blackout) and mesh/net (sheer) and feels tough. Even splashing water on it will not damage it (may stain though). 2. Is it really cordless? No, the cords are inside just like mini blinds but you can touch them because they are separated by the fabric. Not sure how they work but probably in a loop as you push up and pull down. You can only see the cords through the sheer portion of the shade. 3. Is it durable? Only time will tell if the cords will become uneven or snap but so far first day of use, they feel very smooth to operate and I think they should be no worst than mini blinds as far as reliability goes because there is less strain (weight) on the cords but when they become uneven, not sure how to adjust it because you cannot access the cords. One of the 27 inch one is already uneven upon installation. The instruction sheet says they warrant against defects as long as you own your home so I guest that means lifetime? These are made in China for HomeDepot by a company called Niem Made Enterprises, a Taiwanese company that has been around since 1974, public traded and has a 1800 phone number for North American customers. So I would hazard to say that good chance they will look after you if the product does fail. 4. Easy to install? Yes, if you take the time to measure twice and drill once and ensure the screw has proper footing so they don't become loose. For the larger width that comes with 3 bracket, you will have to make sure all 3 align or you may have trouble clicking the top rail in. I suspect the review complained about this did not align the brackets. The 60 inch one came with larger brackets are are easier to click in than the 27 inch ones. The not so good: 1. The clear plastic handle for moving the sheer portion up and down could be better. It is hard to slide in place and feels like it can snap overtime. 2. The bottom part (blackout) could use a tab like the sheer portion. 3. The instructions for 27 inch says to remove the inserts from inside the rails before installing the end caps but the 60 inch instructions skips this step entirely. I removed them from one of the 27 only but completely confused as to why because you don't have to! 4. One of the 27 inch is uneven and will have to bring it back to exchange! I hope this helps someone out. Would have been 5 stars if not for the NOT SO GOODS above. Rated 5 out of 5 by jbeda from Excellent blinds We have purchased a number of these blinds in the past month. The blackout portion is comletely opaque, letting no light through the mylar/metalizied interior layer - with a tight fit at the edges it completely blacks out the room. The sheer portion lets in lots of light but doesn't allow anyone to see into the house. Can you surface mount these blinds? Thank you for your question. The shades come with top mounting brackets. The brackets allow you to mount the shades on the ceiling or in window frame. Are these cut to actual size of the window.